You may find this number on a separate card inside the product box or you will find it printed at the bottom of your invoice, whether you receive it by e-mail or in paper form. Please keep this serial number printed and at a safe place. It is your proof of purchhase and you will need it for reinstallation and possible upgrades! 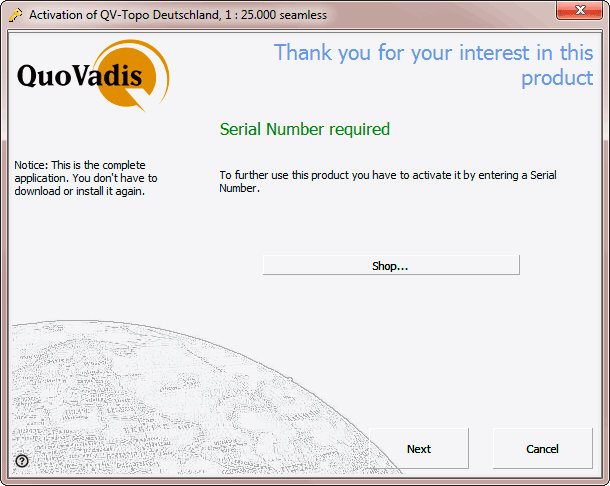 When you start QuoVadis for the first time, a window will automatically pop up asking you to enter your serial number. Please enter your 35-digit serial number and click Ok to start the activation assistant. If you want to try the demo-version of QV, just click Cancel and test QuoVadis for 25 days with unlimited functionality. For the maps and the elevation data of our QV-MAP series the display for entering your serial number will be starting automatically after the first opening of the map. 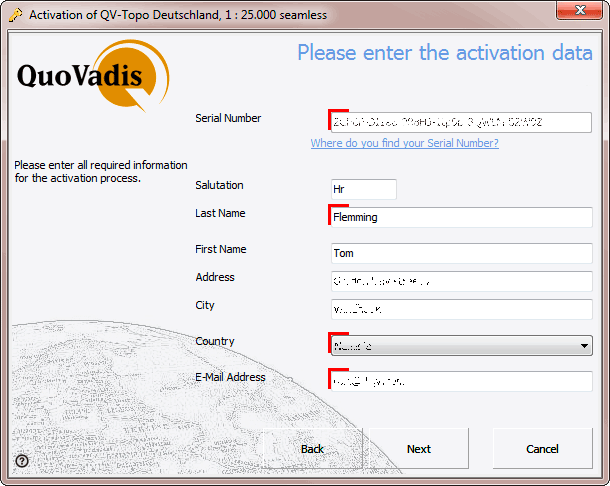 When you have bought the new map for QuoVadis 7, please enter your 35-digit serial number in the enter-field and click Ok to start the activation assistant. The QV4-serial number contains always a 4-5-digit number and can also have (dependend on the version) a -L, -ST, -QB, -PU or -PROF. Examples are 0001-PU or 12345. Click Ok when done to start the activation assistant. In the first window you have to select if you want to unlock the map or if you only want to test it for 4 days. Online-activation - lasts only a few seconds, but needs an internet connection. 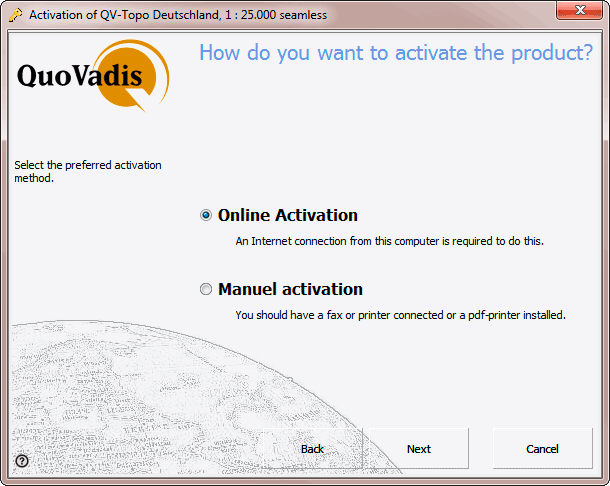 Manual activation - in this case a document will be printed, which you can fax or mail. You have to specify at least your name and your e-mail address. We guarantee to keep this information safe and confidential and will only use them internally in a support case if required. Thereafter, you can use the map as any other installed map. In case you have requested an activation code via e-mail or through fax you will have to enter it in the QV main menu under ? > Activating QV and maps. Just enter your 35-digits activation code and click Ok.
? 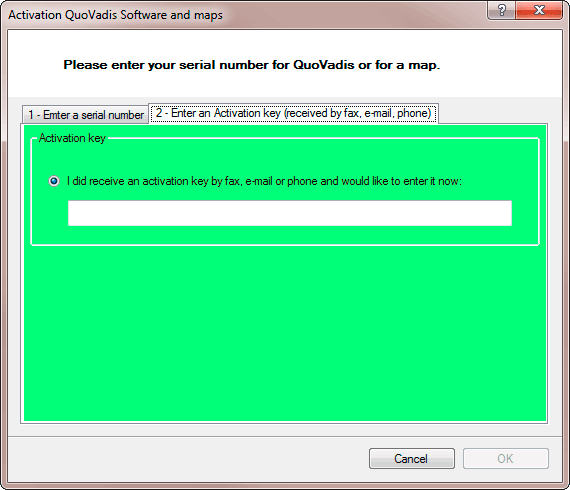 > Activation, QuoVadis Software and maps…..
enter the 35-digit activation code you received by e-mail and click Proceed/ok. 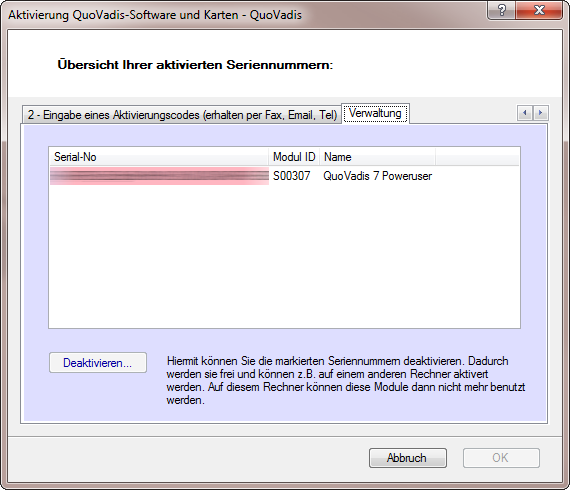 If you want to know which modules are activated in your QV installation, just choose ? > About… from the QuoVadis 6 main menu. You will find your entered user data and also a list of all activated moudules including the corresponding serial numbers. 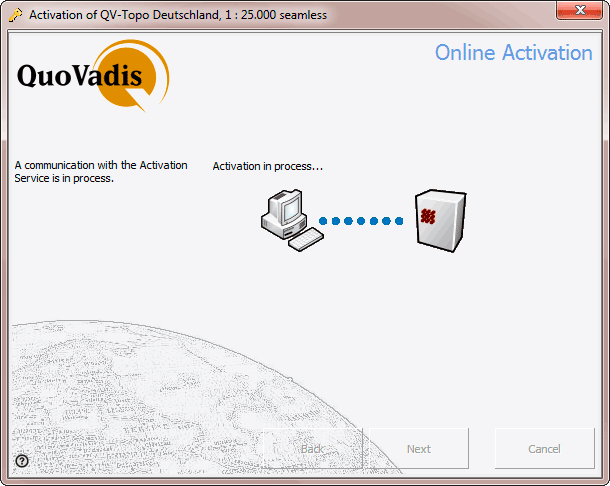 All module activations are documented in a file named lp_QuoVadis 6b.lic which is located in the folder QuoVadis 6_Data\_Lic. After every activation you should produce a security copy of your file and yould store it in a safe place (extern drive, USB-stick, burned CD-Rom)! If it should be required to reinstall QV due to whatever reason, you can copy this lp_QuoVadis 6b.lic file back to your PC and overwrite the empty lic file which is generated during program installation. Thus you have reactivated all module at a glance. It is also a good idea to carry a copy of this file with you when travelling, especially in countries where internet access might be difficult. The Lic-file is not portable to another PC. When you install QV on a second PC, you have to release QV again with your serial number. On the last tab Administration you can deactivate your licences. 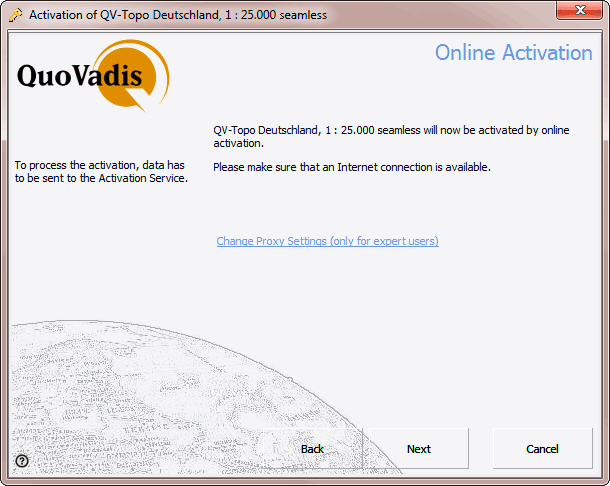 You should do it, if you plan to remove QuoVadis permanently from your PC. In this way the activations on the activation-server will be released. Then the serial numbers can be activated on another PC. Please mark the serial numbers in the list, which you like to deactivate and click on Deactivate. Every serial number will be deactivated online after your confirmation. Therefore you need a internet connection.